If you own a horse but have not yet experienced an episode of colic, you are both lucky and a rarity. Colic is not just a common condition in horses; according to the American Association of Equine Practitioners, it is the No. 1 cause of death among them. Proper veterinary care and treatment resolves many incidences of colic, and you can minimize some episodes. Arm yourself with colic facts and realize that each horse and colic episode is different. Knowing your horse’s normal behaviors will help you identify when something is wrong. Some horses lie down for different reasons, so knowing your horse’s usual behaviors will help you differentiate between his usual routines and a colic episode. If your horse frequently lies down to rest and is calm and still, you won’t immediately assume it’s a colic symptom. If he lies down longer than usual, gets up and lies down repeatedly, attempts to kick at or look at his stomach, rolls or thrashes, then check for other symptoms and prepare to call a vet. Pawing is a way for horses to communicate; they lift a front foot and paw at the ground repeatedly. 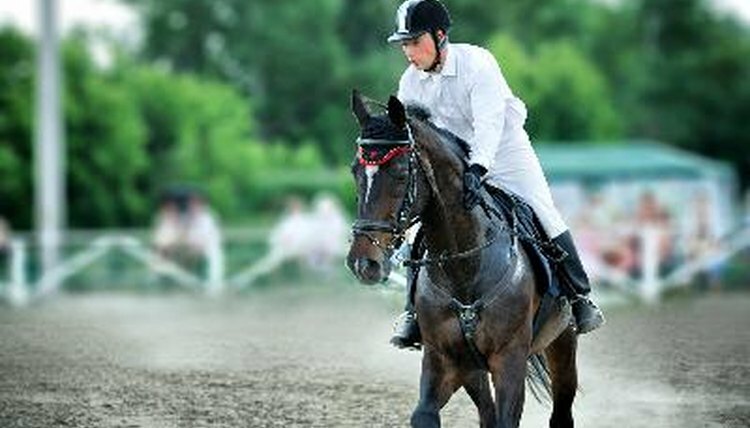 If your horse routinely paws because he is impatient while standing tied or waiting for food, then the act might not indicate a health problem. However, if your horse does not routinely pawing, but he spontaneously starts, or if your horse paws under a different set of circumstances than normal, such as just standing out in the pasture by himself, pay closer attention. Look for other abnormal behaviors that could indicate colic, such as rolling, lying down or looking at his stomach frequently. You may not notice any irregular behaviors in your horse and then when you give him hay or grain, he doesn’t eat. Especially if your horse usually attacks his food at feeding time, not eating is an indication something is wrong; it is a common colic symptom. Watch for any other behaviors that may indicate colic, and immediately remove all hay and feed from his stall or pasture area. Keep water in front of your horse but don’t try to force it into his mouth. If the manure output in your horse’s stall or living area notably decreases, check for other signs of colic. Diarrhea can be a colic symptom, too, particularly of sand colic, whereby sand is ingested and accumulates in a horse’s colon. Astute horse owners will routinely hear loud digestive sounds – commonly referred to as “gut sounds” – emanating from their horses’ stomachs. If you lay your ear against your horse’s stomach and do not hear any gut sounds, he may have colic, particularly if other symptoms are evident. With sand colic, though, gut sounds may change and resemble large ocean waves. Lip curling, abnormal sweating, nervous or depressed behaviors, and rapid or shallow breathing are visible signs that point to colic. Check your horse’s gums for dryness and a purple hue; healthy gums are pink and moist. Take your horse’s rectal temperature if you can do so safely so you have that information for your veterinarian. You cannot wholly prevent colic from occurring. If and when it does occur, you often won’t know the cause. The best you can do is practice good horse management. Treat for parasites regularly; give your horse clean water, hay and a high-quality feed; make sure he has plenty of turn-out and exercise; and make any feeding and living condition changes gradually. Know your horse to know when he's becoming ill.